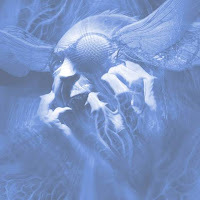 With Mudvayne's last cd, The New Game, being a bit of a tough listen (although I was a big fan of the title track), the band decided to add a bit of something. In short, Mudvayne have discovered old-school blast beats and use it liberally throughout. Wheras it might seem at first the band just following trends, the addition of metal breakdowns and faster playing gives the music a much faster and enjoyable pace. Album opener "Beautiful and Strange" and "1000 Mile Journey " does a good job at showing the band's ability to mix in the blast beats with their more traditional up-front base sound and vocals. However, let's not forget where Mudvayne came from. They were one of the kings of the nu-metal age, and they're still not ready to leave the throne just yet. Lead single "Scream With Me" is a direct throwback to their third album "Lost And Found" and would fit comfortably in it's track listing. Album closer "Dead Inside" can be considered this cd's version of "World So Cold." Plus, musical interludes have returned from their first cd, LD 50. Thankfully, they are much more instrument centric then self-masturbatory electronica bits. The final fact is this: if you're not a fan of Mudvayne, this cd isn't gonna change your opinion much. Even with the addition of old school metal charm, Mudvayne's nu-metalness still shines through the brightest. It won't make them many new fans, but it will please the diehard nutcases. It may even bring back some that have fallen by the wayside. There is not a single blast beat on the new album please learn your terminology before reviewing in teh future. Much faster drumming particularly use of double bass but blast beats. No. You're saying that the start of Beautiful and Strange isn't a blast beat? Come on.